Adventure!, originally uploaded by recaptured. We left Sarchu early, like 8 in the morning, crossed a gang of foreigners on Bullets, climbed the Gata Loops, and took a well deserved short break at the altitude of 16616ft at Lachulung la. 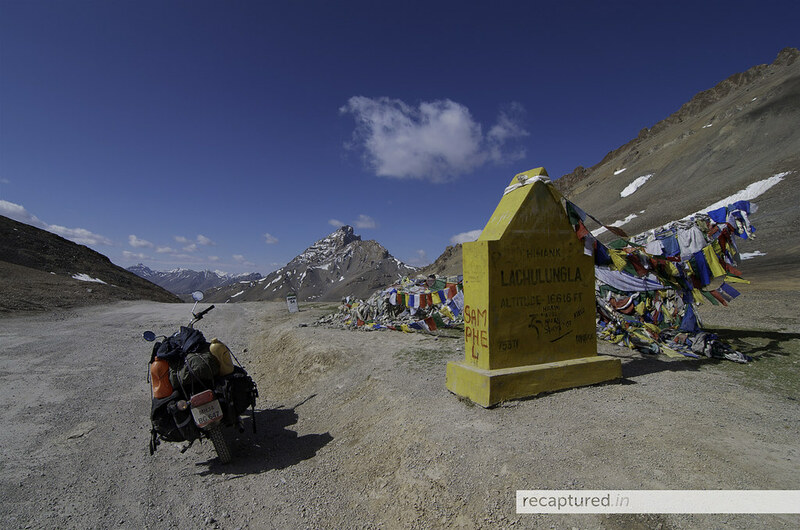 Author AmitPosted on 8 August, 2011 19 May, 2017 Categories Photography, Rides, Travel, Travel PhotographyTags bike, bullet, Ladakh, Leh, motorcycle, Photography, ride, royal enfield, travelLeave a comment on Adventure! Our own little Tso, originally uploaded by recaptured. On our super leisurely ride from Keylong towards Pang (that it ended at Sarchu that day is another story), we found our very own Tso. Heaven?, originally uploaded by recaptured. A peaceful beach, sunset, Enfields and riders around us. This is most definitely heaven. 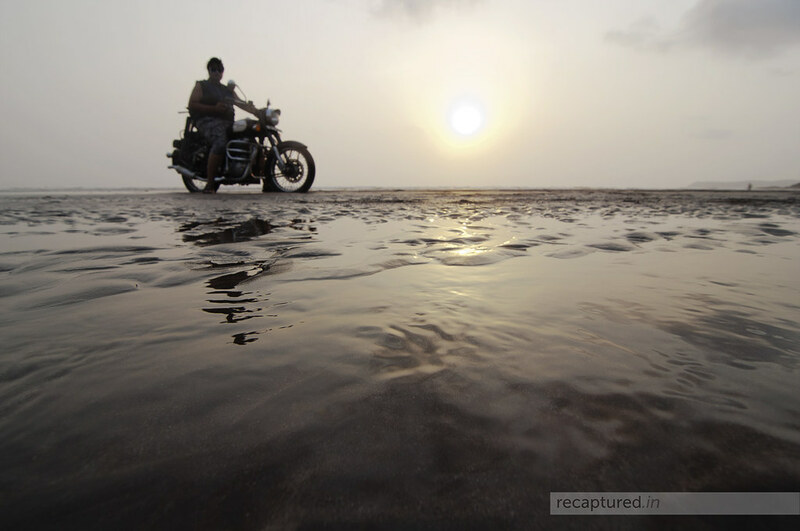 Author AmitPosted on 8 May, 2011 19 May, 2017 Categories Photography, TravelTags beach, bike, biker, bullet, Hedvi, royal enfield, sea, sunsetLeave a comment on Heaven? 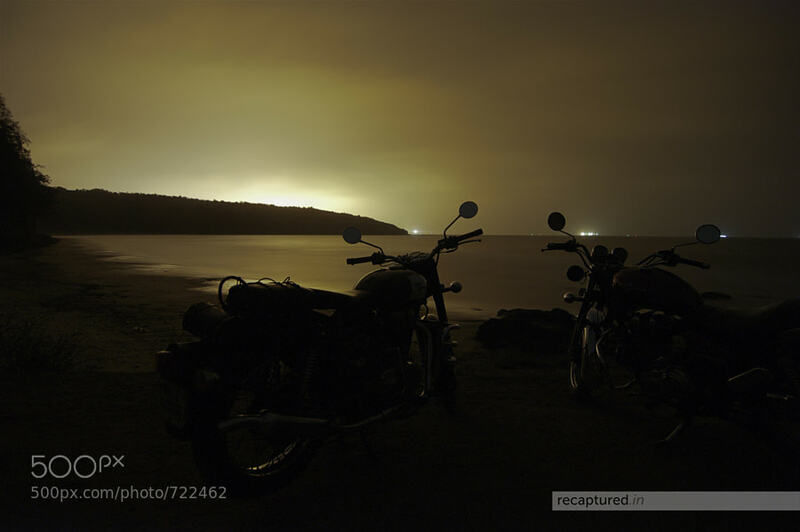 In the Diwali of 2010, two bikers headed southward from Pune, not knowing what obstacles they’d have to cross on the way to their destination – Gokarna. And two months later, they did not know when Pune Mirror would put their story of this trip on the back page of their paper. They came to know only today, when they started getting messages from ecstatic friends about becoming famous et al. Without further ado, here’s the online version of the article, though it doesn’t mention Nipun’s name or mine. But then, there’s always the ePaper version for you to see the article in full glory! Author AmitPosted on 21 January, 2011 26 May, 2017 Categories Narcissism, Photography, TravelTags bullet, Gokarna, Karnataka, nipun srivastava, pune mirror, road, travel, trip5 Comments on Go… karma? First up: there are no photographs for this post. Apologies for that. After some 20 minutes of riding the bike on what can hardly be called a road, full of gravel and hardly any traction, I saw the bikes that went ahead of me and their riders waiting for me, and the others behind me. “Whew!”, I felt, “This must be it”, and got off the bike. A moment of realisation – I have been here before. In the last monsoon, we drove BlackHawk and the White Monster up this hill. But back then, there was some semblance of a road. Not this time. I was standing before the Slopes of Hell. At last. Like a pilgrim before the Holy Land. Like a devotee before the altar. Humbled, nervous and charged at the same time. Ever since I started meeting other riders in Pune, I have been hearing about this legendary place, where all riders fall, where once you are on the slope, you can’t stop, and where your real mettle as a rider and your rapport with your machine is tested. Numerous times I had missed coming here. Maybe because I was afraid every time. But Friday night when Kishore sir said that we will ride to Slopes of Hell on Saturday night and whether I will join in , I decided that I will face my fear this time. That I will do whatever I know I can to make sure the bike is in a decent enough condition to go up. And, for once, I will do just riding: no camera, no photography, no videos, just riding. Now the fear was coming back to me. I was scared while riding through the trees on the road I just travelled: what if I brake at the wrong time and the rear-tyre skids? What if I miss a turn and fall into the dark ditches? What if I lose my way? I would not be able to turn my bike around on these roads! And now I heard people saying “Now the real fun begins”. If the real fun is going to begin now, what was happening so far? All the bikes and the car reached where we were standing. And then Tinu and Kunal decided to walk up and do a recce. They came down with news: the track has worsened since the last time they were here. There was now a one-foot step on the track, which will kill your bike if you took it from the wrong side, which would be on your right. And it’s more bumpy now. It was good news for some, who now wanted to take their bikes up as soon as possible (yes, I’m looking at you Nipun). But for me, it was scary. Not bad news. Just scary. Kunal and Tinu then rode their steeds up, one by one. We saw Kunal cover that slope like it’s his backyard, with his wife riding pillion with him! “500cc!”, we admired. But the fact is that you primarily need balls of steel and an amazing rapport with your pillion in order to pull that off. The bike is secondary. After Kunal reached, Tinu rode up. Then they both trekked back to brief us. “Don’t leave the throttle, don’t touch your clutch, don’t brake.” “If you stop or hesitate for a moment, you will be stuck, and then 5-6 guys will have to bring you down, with you sitting on the bike all the while.” And first gear is the answer to the question that was looking down at us. I could hear my heartbeat clearly. While I was contemplating all this, two riders went up one by one. We saw Nishant braking just when he got on the cobbled slope, and we had to pull him back down. There were riders going up, covering the cobbled slope and braking or pressing the clutch just when they crossed the 1-foot step, and coming back after having their bikes turned around with the help of the 3-4 guys standing there. Their names and order are all blurred for me: they were obscured by my loud heartbeat. Tinu came down, and told us that we are all making the same mistakes – we’re braking when we’re not supposed to. It was just panic, nothing else, but we’ll have to overcome the instinct to “gain control” on the bike through brakes and the clutch. It was just the steering and a consistent throttle that was needed. After another of the riders was sent up, Tinu asked “who next?”. 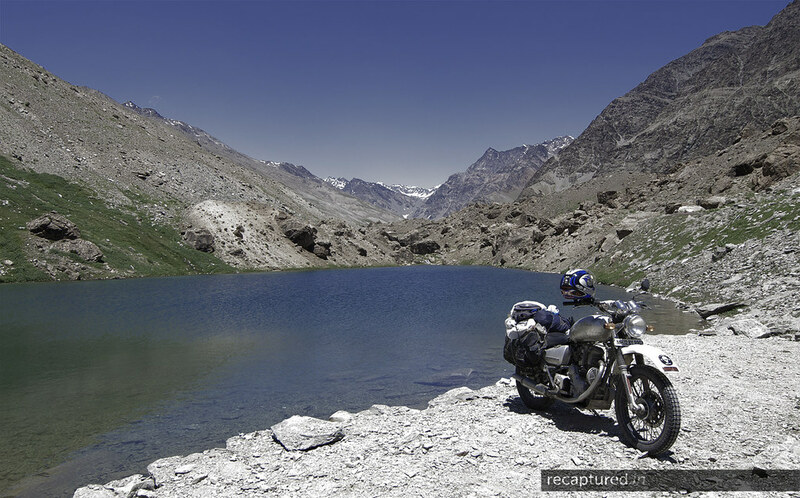 Nishant wanted to go, but Tinu insisted that his bike should cool down before he attempts it again. And in the short silence that followed, I heard my voice: “I’ll go”. Tinu agreed. I brought my bike up at the starting point. People asked me to pull my bike back, away from the slope, so that I would get a start, just the way we were all briefed. But Tinu confidently let me go, saying that I will be fine. In a gush of adrenaline, I pulled the throttle and released the clutch, bidding the clutch lever bye bye for at least the next 10 minutes. I was determined to follow all the instructions – no letting go of the throttle, no over-revving, no clutch, no brakes, no gear shift. I rode up the cobbled slope, cleared it. Then the rocky patch began. And I was on the lookout for the 1-foot step that was now deeply ingrained in everybody’s psyche by now as the monster to watch out for. I think I went over it, right when I heard Kunal shouting “keep going! keep going!!”. So I kept going. No braking, no stopping. The bike went up in the air a few times, but landed back straight. Then another steep left turn, and I was amongst friends who were waiting for me. I finally parked my bike and gave out a loud yell of victory. I had come up the Slopes of Hell without a break! As people kept coming up, we started settling down. Then a few of us trekked down to the car to bring up the “essential supplies”. Walking back up with all the stuff was tougher than anything we had done that day! And once we were back up on the hill, all settled and huddled around the bonfire (made of waste plywood and petrol over a period of one hour, no less! ), the Firelords type ‘fun happened’. Puns, jokes, one-liners, tee-shirt slogans, silly songs, anecdotes, stories from previous rides, and a silly game that kept us all thinking for atleast half an hour (Thanks to Vijay and Dhruv). And then there were the mushy couple and the lonely hearts – it was 14th already! After having a stomach-full of biryani and beer and a couple of hours of full-on masti I tucked myself in the sleeping bag and went to sleep under a sky full of stars at around 4. We were woken up by Tinu’s bike thundering away at 6! He rode down on his own till the car, just to see how easy or tough it was. I woke up to find the world around me painted in myriad hues of blue, purple and orange! And there was mist between the hills. It would have been great if my camera was with me, but as I had decided before, this was about the ride and not photographs. We decided it would be wise if we all left together instead of lazing around, lest we get stuck alone on our bikes with no one around to help. So we all packed up, tried to freshen up, collected the unopened bottles, unburnt wood, and empty bottles and packets, and took them down to the car one by one. And then we fired up our bikes and waited for a briefing from Tinu with bated breath. And he tells us “there are no tips guys” with a weary and sheepish smile. We were on our own. Just try to keep the bike steady. You can’t ensure that your bike would not skid, but if it did, you can try keeping it on the path. Some other riders came down without a hitch, some fell once, some twice, some thrice, and one rider’s bike got damaged – the headlamp and front brake lever now needed to be replaced once he reached Pune. Then we took off down the bushy trail one after the other, till we hit the highway for cutting chai – which was more doodh than chai, and then we took off toward our respective homes. 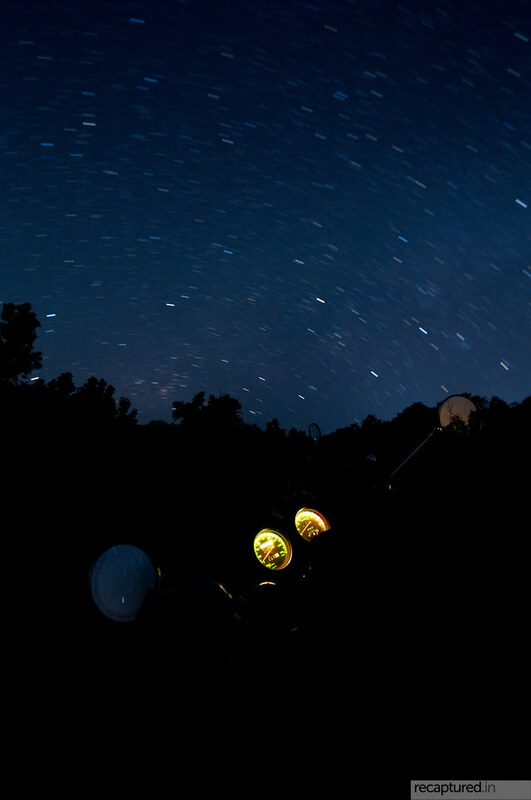 On the highway, it felt like I had cleared a rite of passage as a rider. I felt bigger. I felt prouder. I felt more complete. I have a Slopes of Hell experience under my belt now. And I realised once again why I have chosen to be a Firelord. It’s because of the camaraderie, the bonding, the all for one and one for all attitude, and the mindless fun we have whenever we are together. I think I will get a calling from my Holy Land again. And I pray that then I would complete the ride better than I could the first time. And I will ride it again with my Brothers.